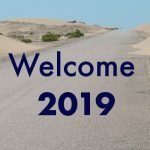 One of the most difficult aspects of travel was upon me: coming home. Although “coming home” doesn’t quite fit because for the last ten years, I haven’t had a home. For me it means, returning to Germany and relying on the hospitality of my sister. What did I do with my last days of freedom? Early in the morning I was at the harbor in Rødbyhavn. I had just missed a ferry but already a new car queue was forming. There was a ferry every half hour to the German island of Fehrmarn. The holidays were coming to an end and many had to return home. At this hour I was the only cyclist. After 45 minutes I was back in Germany. The skies seemed to reflect my mood and there were heavy dark clouds. In Puttgarden I first wanted to go to the railway station to buy a train ticket and bike reservation for the fast train between Hamburg and the Black Forest. It was virtually impossible to do this online. Sadly, there wasn’t much left of the railway station in Puttgarden, only self-service ticketing machines. They weren’t useful and I left without having accomplished the task. Fehrmarn is quite small but it has 300 kilometers of bike paths. When I had visited the island for the first time fiften years ago, they didn’t exist. The most popular trails went along the coastline. I drew a lot of attention with all my bags. 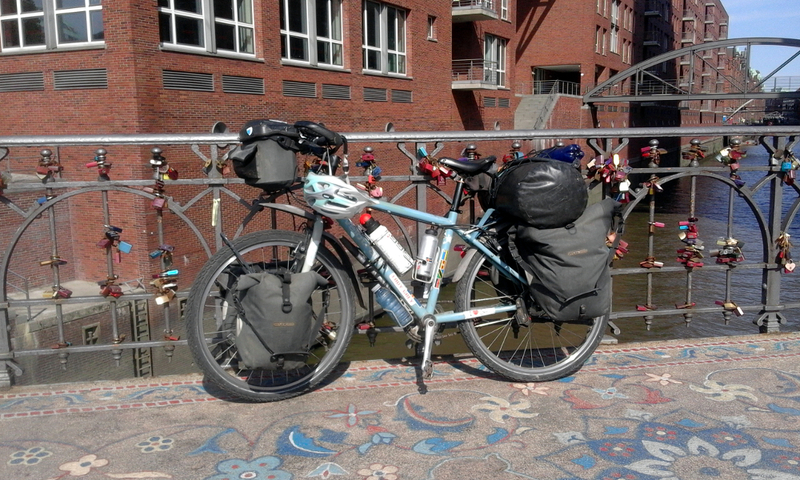 Today I cycled straightway to the other side and across the Fehrmarn Bridge to the mainland. Fortunately, the wind wasn’t too strong during the crossing. I immediately went to a supermarket to buy all the things which I had missed for so long. In addition to Radler (beer with lemonade), I bought chocolate with yoghurt and Studentenfutter (nuts and raisins). 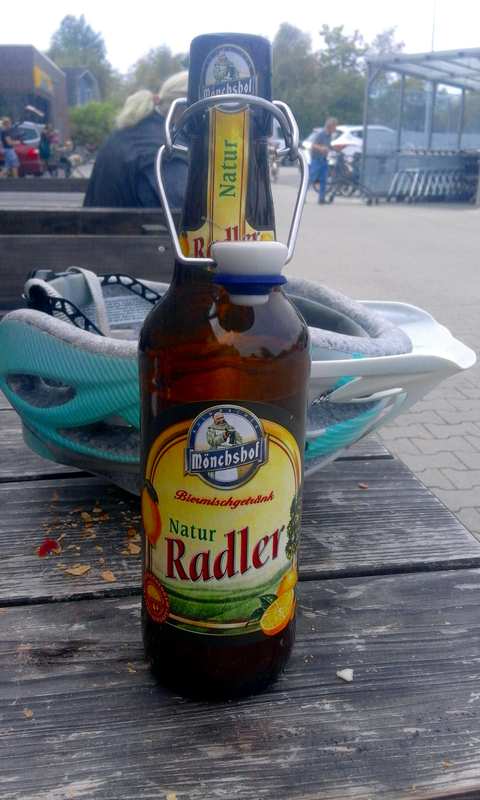 I didn’t really need so many calories because I only had twenty kilometers to my friends’ place in Oldenburg/Holstein. In Oldenburg/Holstein there was a railway station but once again no counter. However, there was an office of the TUI travel agency where I bought a rail ticket with reservation for my bike. Everything was booked solid for the next few days and the next available bike space was only a week later. I wasn’t sad that my “homecoming” was delayed. My friends treated me well and I started on the last stage of cycling on this trip. Northern Germany is quite different from the south. First, I cycled along the Oldenburg bay. A beautiful bike path wound through the fen landscape of the nature reserve. In Dahme I reconnected with the Baltic Sea. Suddenly it got a lot busier. It was holiday season, the weather was good, and people were out and about. Do these beach chairs exist anywhere else? I only knew them from the North and the Baltic Sea. 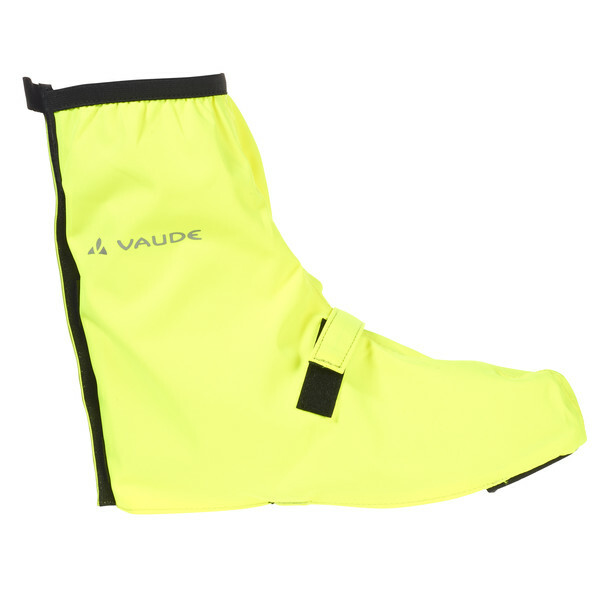 Maybe they’d look funny at Copacabana or in Phuket. 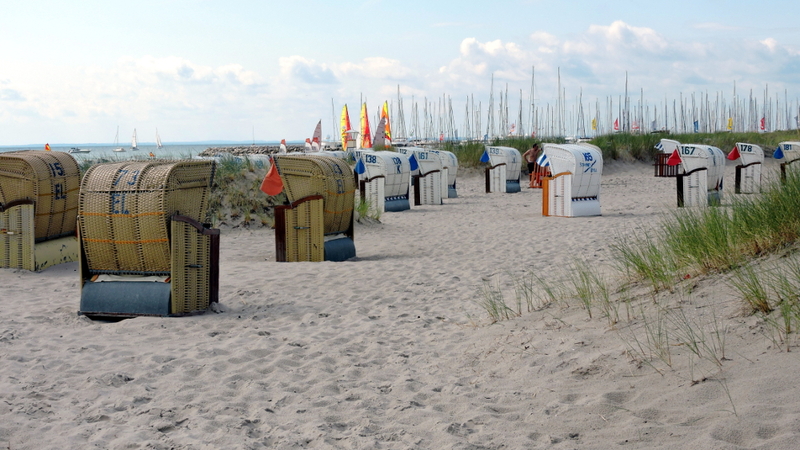 When I reached Timmendorfer Strand I had had enough of beach tourism and turned inland. A big advantage of this season was that the fruit and berries were ripe. The roads were lined with blackberry bushes. Most people hurried past in their cars and the best berries were left for me. The ground was littered with yellow plums. It seemed that the farmers were overwhelmed by the fruit. For me it was paradise. I looked for a shelter to spend the night as I had done in Denmark. What I found was a very sad affair. Too bad that those responsible in Germany don’t emulate the good example of Denmark. 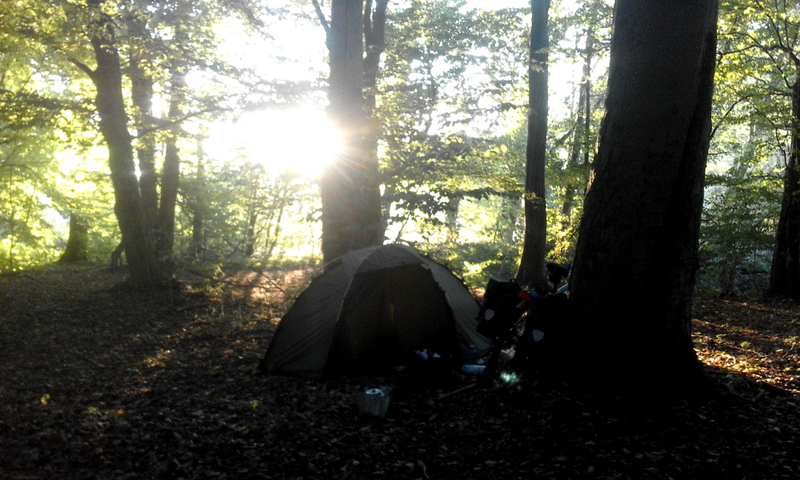 I used my tent instead and found a pretty, quiet place in the forest. I knew I was breaking the rules. As long as I didn’t harm flora and fauna, I didn’t see a problem. I couldn’t be seen and afterwards, no one could see where I had camped. 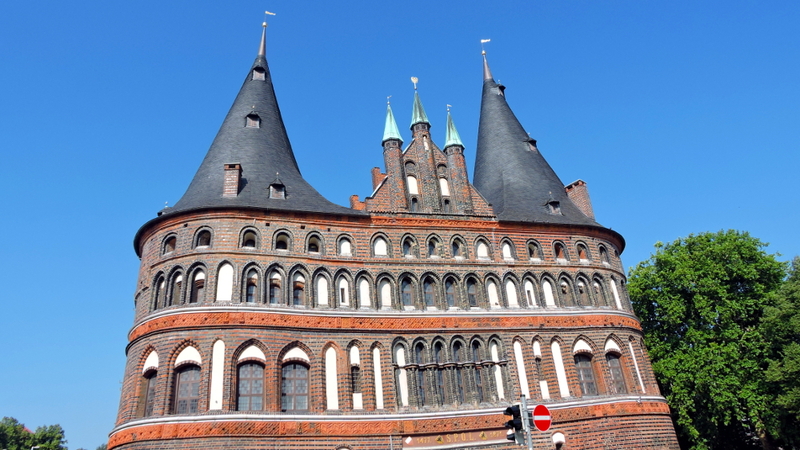 Early the next morning I reached Lübeck. 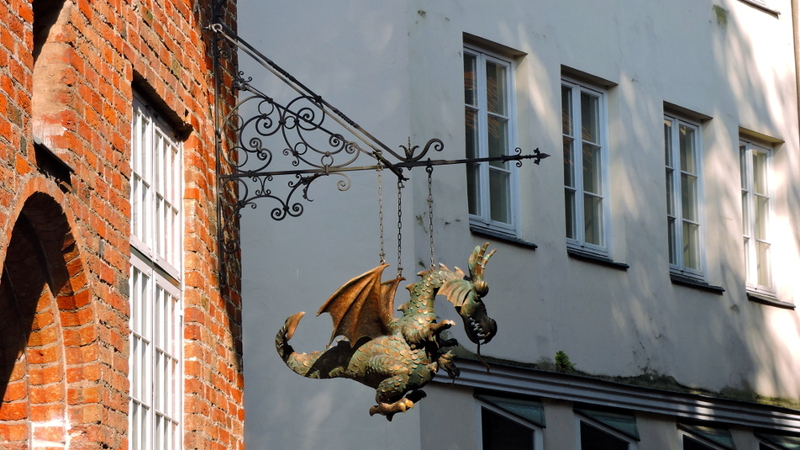 I had never been to Lübeck and it was one of the cities that interested me. Therefore, I planned to stay a few hours. Even so it was a larger town, there were these pretty and calm interior courtyards. I can imagine that the inhabitants must be quite annoyed with the tourists coming through their front yards. There was a square named after Willy Brand and a house in honor of Günter Grass. On small roads I traveled to Ratzeburg. The towns were so close to each other that by afternoon I sat on the town square of another city. 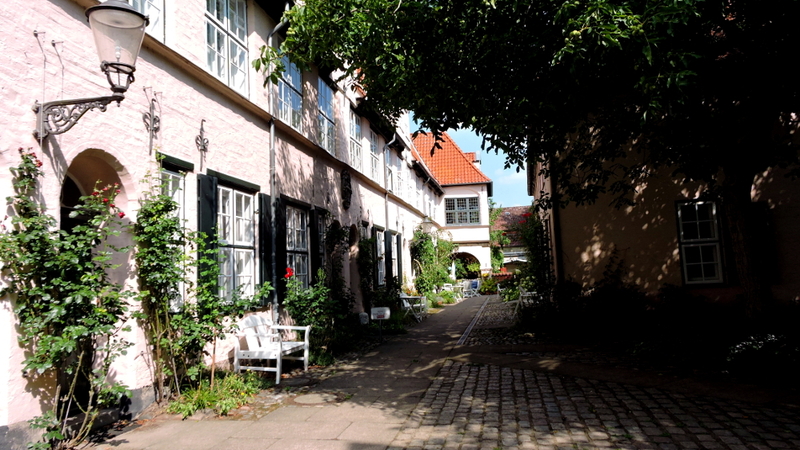 The old town was situated prettily on an island in the Ratzeburger Lake. There I sat and pondered how to continue. I had so much time left. I could pick the prettiest place from the map and start cycling. It was marvelous. The Salemer Moor is a fen area in a large forest with lots of lakes. It was a nature reserve and stealth camping was definitely prohibited. In such a case, I respect the rules. It wasn’t a big issue because there was a nature camping place at the Salemer Lake. I could camp right at the lake and it was very quiet. My idea to spend perhaps two nights were gone next morning when I heard a popular German folk song blaring from a speaker. I quickly departed. The weekend had started and it would be busy. I had time and slowly cycled to Mölln. The trip was almost over and I wasn’t really in the mood for anything. 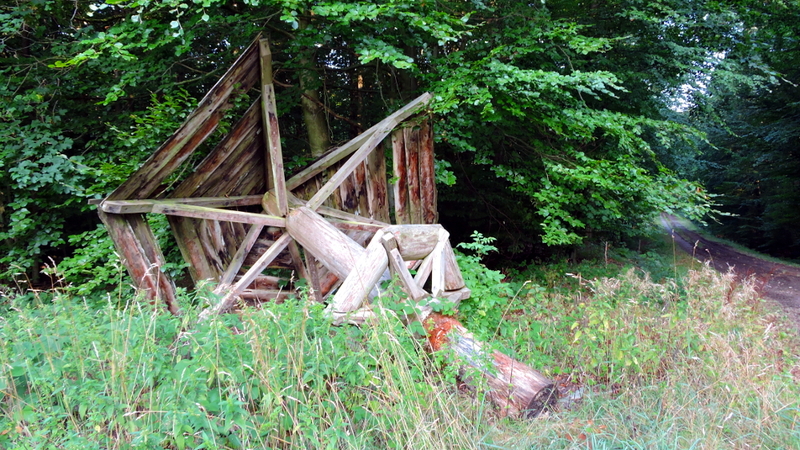 With my GPS I found a place in the forest that was accessible by bike. I ended up in a cul-de-sac next to a pond. My last night alone in the forest. I simply sat there and enjoyed: the quiet, the green of the birch leaves which altered with the changing light. Oh, how lovey to simply sit, watch, and savor. A nature lover passed by to look for water birds. When he departed, I pitched my tent. Too bad that there were no shelters like in Denmark. Nature lovers could take advantage of the early mornings and late evenings. I was awoken early by swans which passed overhead with loud screeches. My last day on the bike started. Hamburg was only 40 kilometers away. It was Saturday and when I reached the suburbs I already had difficulties breathing. How could people live so close together? Downtown was even worse. 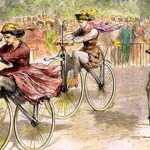 There was a bike race in which anyone could join. 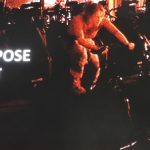 After I had cycled solo for about 5,000 kilometers, I didn’t feel like to bike for more than 80 kilometers in a throng. Before I went to my friends’ place, I took a detour to the renovated harbor city. Every time, I enjoy visiting the historic warehouse district. And the new landmark of the city. 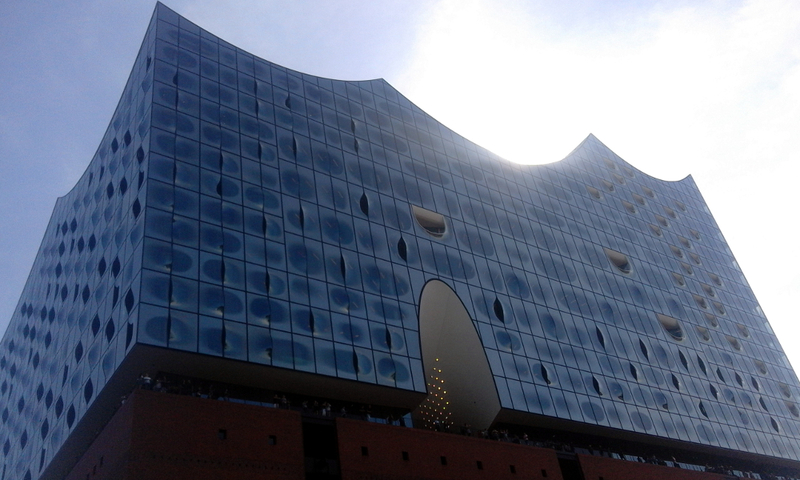 I couldn’t get closer to the Elbphilharmonie (the city’s new home for its philharmonic orchestra). There were a thousand tourists around it. Within a short distance, the city had changed profoundly. This was St. Pauli. At first, I wondered how my friends could stand to live here. After all they were nature lovers. Soon I discovered the advantages of the neighborhood. People knew each other! Their little boy could go out by himself to play soccer on the street or behind the church. And the courtyards behind the houses were very quiet. A little story: I had the chance to play soccer: two against two on a very small field. It was fun! But I was almost embarrassed to admit the next day that my muscles ached. I hadn’t used them in a long time. On a bike you use other muscles. The train trip to the Black Forest was almost the biggest adventure of the whole trip. The rail car with reserved bike space was supposed to be all the way in the back. That wasn’t the case. At least ten cyclists with fully packed bikes rushed along the platform looking for the right car. Car #16 was somewhere between #14 and #12. It was impossible to board the car because there was no electricity and the doors wouldn’t open. We had to push the bikes with all their luggage through the narrow passageway, past passengers who were looking for their seats, until we got to the bike car. Because the AC in the car didn’t work, the bikes could stay but no passengers. More chaos! When everyone had boarded, the train was quite a bit behind schedule. At every stop, more delays. I only made the connection in Karlsruhe because a fellow traveler through the bags in behind me. Doors closed and we departed. This was the end of my wonderful trip around the Baltic Sea. I can really recommend the route which is very suitable for cyclists who aren’t seasoned travelers. If you don’t want to camp, you can always find accommodation. And almost everywhere there were bike trails. 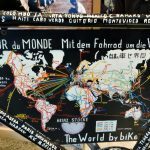 Please get in touch if you want more information and happy biking!